The ultimate present for any young petrolhead that you know. 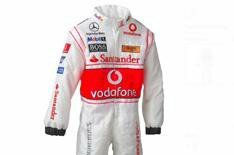 A replica of the actual race-suit worn by Lewis Hamilton during his record-breaking championship-winning 2008 season. The perfect gift for the Lewis-obsessed little 'un in your life, the replica racing suit comes in three sizes, which cover age groups from 3-11 years. A t-shirt with zip-up turtleneck, emblazoned with exploding Union flag graphic on the front and Hamiltons signature on the rear. The shirt has reflective piping on the shoulders making ideal for both training and casual use. It is available in all sizes. Know someone who's just had a baby? Then forget about going down the teddy bear and flowers route and instead give their newborn petrolhead a fully branded 911 romper suit direct from Porsche. It comes with a hat, and one size fits all. For baby boys and girls. Let someone you know live the Porsche dream, with this branded neck tie. Offered in a classic stripe design, the tie is adorned with a discreet Porsche logo on the back. Made from 100% high-quality silk. A black leather belt subtly embossed with the legendary Aston Martin name. Give someone a piece of Bond's marque of choice without having to remortgage your house. Head online and choose your size. Help someone join the exclusive Lamborghini owner's club with this authentic bodywarmer. It comes with Galllardo wheel buttons, a large logo on the back and it's filled with 100% goose down. These are an ideal gift for a man who likes expressing his love of driving in a subtle fashion. The cufflinks come with a gearshift pattern printed on the face - they should bring a bit of interest to even the dullest of shirts. Ergonomically designed black sports shoe that incorporates the brand's metallic grey colour in an aerodynamic line that runs along the entire length of the shoe. McLaren Sport logos are on the tongue and top of the instep. Know someone with a love of all things beemer? Then a pair of BMW Sauber trainers could be the perfect gift. The white shoes come with dark blue sole and have the BMW Sauber F1 logo printed on the upper. These are for the men, but check out the website for female options. Available in sizes 3.5 13. The design team at Porsche Design has created a sleek collection of masculine half eye 'Reading Tools'. The design is complemented by 1.6 index, anti-reflection coated, Rodenstock lenses. Mounted in high quality thin stainless steel and high-tech plastic silver and black frames, they weigh just 15 grams. Available powers are: +1.00, +1.50, +2.00, +2.50 dioptres.